Exp, Star Stones, Runes, Stones. 1. During 02/02-02/28, you can claim free rewards for staying online. 2. 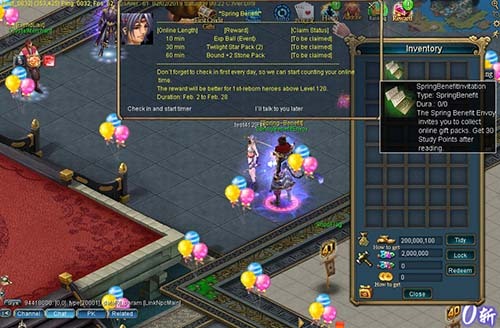 If you are level 100+ or reborn, you will receive a Spring Benefit Invitation at login. 3. Read the invitation to get 30 Study Points. 4. Talk to Spring Benefit Envoy (Twin City 353,425) to start Timer every day. 5. Once you stay online for 10/30/60 minutes, you can get your rewards from Spring Benefit Envoy.